A light evening meal of soup, with a selection of seafood from Fleur’s with coffee and cake to follow will be provided (included in ticket price.) BYOB. Kids of Hampden School will entertain us before the debate. $15 Tickets: 100 only on first come basis with some special guests and media by invitation. Book your place with Elizabeth Norton Tel 03 439 4887. Note: still to receive a positive response from government representatives. In the event that the challenge is not taken up, members of our debating team will address the audience and there will be open discussion facilitated by Mayor Familton – so have your curliest questions at the ready just in case! Natural Heritage Society Oamaru Transition Town project and 350amaru are showing as a follow up to 'The Age of Stupid Movie'. Gold Coin donation, supper after. In Transition: The inspiring story of the global Transition Town movement. A community response to the challenges of Peak Oil and Climate Change. ... we're planning a week! Here is the 350 Oamaru Program for the 18th to the 24th October. Please pass on the program, Age of Stupid flier and Be Empowered sheet to everyone you know! The 350amaru crew have worked really hard to link with a number of community groups. It's going to be a really interactive and fun week – they're looking forward to your amazing support! 12.30pm–2.30pm – having fun and learning about the Oamaru Creek. Oamaru Community Gardens Harvest Exchange and 350 seedlings to give away! At Fenwick Park, Chalmers St.
Students, workers and shoppers are leaving their cars at home.Tune in to Classic Hits radio every morning for live coverage! Oamaru premiere of The Age of Stupid, the new, highly acclaimed doco-drama about climate change that's taking the world by storm! At the Oamaru Movie Max Cinema 3, 7.15pm. Supper and discussion after the film. Rated M (contains offensive language). Tickets $9, available from Harbour St. Bakery, Brydone Growers, WRRP, or phone Gail on (03) 434 9761. The Schools Day of Climate Action in Oamaru and across the nation. Including a big push alongside Active Transport and Sport Otago for walking and cycling to school! A FREE cycle maintenance workshop between 1.30pm and 3pm, with Rob from Vertical Ventures. Bring your bike and bike tools (if any!) Ride on the stationary penny farthing for 30 seconds! Grainstore Gallery, Harbour St.
From 8pm on, 350 The Gig will be happening at the Penguin Club. A free, vibrant night of local entertainment, choir, dance and song. All Day - Stone carving. 10:00am - Planting of Swan Plants by children. Story telling by Marie Grunke. 10:45am - Grafting workshop. Bring a sharp knife. Michael O'Brien - William Morris and the Arts & Crafts movement. Chris Gourlie - Outline of how a traditional crafts school could work, to encourage discussion among members. Contact: Lyn Bond on 437 0529 (ext 541), ask for information on the Sustainable living Course. Everybody knows our global environment is suffering and most people, given the choice, want to do something constructive about it! If you are interested in making a difference, but are finding it hard to get started, unsure where to start or how to find information, The Sustainable living course is for YOU! Do you know how to use a scythe? Do your garden tools need sharpening? Bring scythe and sharpening tools if you have them. This is a Waitaki Community Gardens project. Contact: Marian Shore 027 724 1130. Back by popular demand. It is bigger and with more team challenges than ever before! What to Bring: Mobile phone; pen/pencil; hat; water bottle; weather appropriate clothing (be prepared for 1 team member to potentially get wet;, closed in shoes; snacks; and of course your sense of aventure. A public seminar about the issues of transport fuel and long range community planning. Susan was the guest speaker for the Natural Heritage Society forums in 2007 and 2008. Susan and her collegues also have a search project running in Oamaru on 6th, 7th & 8th April. The research is to help understand how people adjust their travel behaviour during a time of uncertainty in oil prices. They are especially interested in how/if rural communities respond to rising fuel prices. They invite anyone who is interested to participate. Oamaru and the surrounding area is brimming with people dedicated to making the transition from high energy to low energy lifestyles. They are actively preparing for the effects of climate change and the onset of the time when it will be harder to afford readily available oil and its by-products. Everyone interested in helping to organise a regular farmers’ market in Oamaru is invited to attend the first steering committee meeting. The Waitaki Community Gardens Trust are pleased to invite all interested people to an open day. The gardens are located at the west end of the Botanical Gardens on Chelmer St, opposite the Waitaki Resource Recovery Park . Make Christmas fun and affordable. Experience the sights, sounds, tastes and activities of a bygone era as Oamaru celebrates its origins. Tickets $5 per person, preschoolers free. African Drum and Dance Camp with Mohamed Bangoura, master drummer, Guinea). Drumming 9:00am to 11:00am and 2:00pm to 3:30pm each day. Dance 11:00am to 1:00pm and 3:30pm to 5:00pm each day. Cost before 15 October 2008 is $150, after $175. A joint project between the Waitaki Resource Recovery Trust and Otago Regional Council. HALO Community Network are delighted to announce the 2008 Lifestyle Expo will be held on the 19th October 2008, venue Waitaki Recreation Centre and Orana Park. The Expo aims to promote, educate, and support the Waitaki Community in the areas of health, well being and environmental sustainability. The 2008 Expo will build on previous Expo’s and will promote healthy lifestyles. This year in addition to showcasing community groups and organisations there will be an eco component with an opportunity for some ‘hands on’ learning. Part 'amazing race', part rogaine, part orienteering. The Awakino ski field has the best snow it has had for many years. It is operating most Sundays, weather and snow permitting. Accomodation is available on site. Please contact John Hamilton for more details. Band - The Oxo Cubans from Dunedin. Supper provided, bar facilities available. or phone Sharon Greaney 03 431 3914. Liz and Paul Crosby's place, Frews Road, Herbert. Anyone wishing to learn how to prune fruit trees is very welcome to watch or participate in a demonstration pruning day. For information telephone Liz or Paul 439-5107. Oamaru Repertory Theatre, Itchen Street. A pantomime by John Crocker and Eric Gilder. Box office open daily from Wednesday 9 July 12:00 noon to 1:30pm and 3:30pm to 5:00pm. Phone 434-8868 during these times. Bookings of 10 or more adults $13.00 each. It’s a hands-on event with lots of demos and things to try your skills on. Lots of great information in one place – presentations by some of NZ’s foremost authorities in their fields. Do you know about the generous government subsidies to re-insulate your house? The company that does that will be there. Watch our mayor and Fleur pit their rubbish-sorting skills against the Wizard of New Zealand. Bring along any electric appliances – we can measure their energy use and advise on efficiency. Professor Bob Lloyd has agreed to come and judge our "most energy efficient idea" competition. Bring an entry. One entrant threatened to bring his guinea pigs as energy-efficient lawn mowers! And there will be great morning and afternoon teas and lunch with the best of Hampden's cooking. Antique appraisals with Hamish Walsh & Peter Wedde from TVNZ Auction House. Organised by St Kevin's Home and School. Phone Julie 437-1144 for more information and to book sites. "A model maker's architechural journey from Middle Earth to the Venice of the South." Postal voting forms to be returned to the Trust Office by 5:00pm on Tuesday, 25 March 2008. North Otago choreographer and film maker Bronwyn Judge presents her recent film Koru, a documentary that addresses the endangered ancient culture, river and rare birds of Waitaha. Please bring your lunch and a drink. Informal, uplifting, emphasizing group vocals. Learn some singing techniques and have fun. Sing a mix of songs: jazzy, bluesy, celtic etc. from a mix of countries: NZ, USA, Africa. Lynley Caldwell is a fully qualified and experienced singing teacher who has taught and performed in New Zealand and Ireland. Admission: Adults $15, Students $5 - Kids are free! This is the third in the series of documentaries shown by The Natural Heritage Society Oamaru. "As energy prices skyrocket in the coming years, how will the populations of suburbia react to the collapse of their dream? Are today's suburbs destined to become the slums of tomorrow? What can be done NOW, individually and collectively, to avoid The End of Suburbia?" "It’s the unofficial peak oil documentary adopted by grassroots environmental and peak oil organizations world wide. The film is recognized as the first to announce to a mainstream audience with bold humor and edgy dialogue that the days of cheap and abundant oil – the stuff of which the suburban culture was born and sustained – are coming to an end." "A rousing performance of vibrant Oamaru male voices singing a selection of traditional songs." 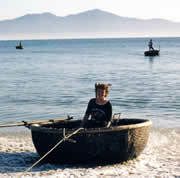 Karen training for the Grand Coracle Race. On tour with special guests "The Builders". Both have new albums out: . 'Human Kindness' and 'Bird In Bush Road'. An outstanding showcase of prominent national and international limestone sculptors. You care about climate change, you want to make a difference … now with Be The Change turn your thoughts into actions and become part of the change! There's no single solution but you can take any number of creative, easy and innovative steps to reduce your own greenhouse gas emissions. Every change helps. The Climate Rescue Team is taking to to road in the Be The Change bus. They are touring the country from Bluff to the Bay of Islands talking about the campaign. ALL ARE WELCOME - Entrance: donation. The Natural Heritage Society of Oamaru Inc is pleased to be showing this film in Oamaru. "When the Soviet Union collapsed in 1990, Cuba's economy went into a tailspin. With imports of oil cut by more than half - and food by 80 percent – people were desperate. This film tells of the hardships and struggles as well as the community and creativity of the Cuban people. They share how they transitioned from highly mechanized agriculture to using organic farming and urban gardens. It is an unusual look into the Cuban culture during this economic crisis. The film opens with a short history of Peak Oil, a term for the time when world oil production will reach its all-time peak and begin to decline forever. Cuba, the only country that has faced such a crisis, is an example of options and hope." Starting from the Waitaki Resource Recovery Park. Oamaru Archdeacon Bernard Wilkinson is planning a march to show support for the Waitaki Resource Recovery Park. The march will start at the WRRP and will proceed down Chelmer Street and across Takaro Park to the council buildings. There the march will meet mayor Alex Familton. Hampden Community Energy Inc A.G.M. "Where to from here, Hampden?" This will be followed by a talk and slide presentation by Robyn (and hopefully Rob) Guyton from Riverton. They will tell us about the truly remarkable things Riverton is doing to make itself a better and more exciting place to live. What is so special about Riverton? So come and hear what another small community has achieved, and what we could set our sights on. To be followed, as always, by an excellent supper. Relax and watch two 30 minute movies personally presented by their creators. still hot from the editing process, about our own remarkable river. Hampden Shops, Moeraki Tavern and Fleur's Place. A very special performance of Oamaru's newest 25 strong vocal ensemble. Led by Lynley Caldwell, this special evening will uplift you with vibrant songs from all over the globe. - "Tohu, a story of the Waitaki" by Bronwyn Judge. How To Save The World exposes globalization and the mantra of infinite growth in a finite world for what it really is: an environmental and human disaster. But across India marginal farmers are fighting back. How To Save The World tells their story through the teachings of an elderly New Zealander many are calling the new Gandhi. Peter Proctor is almost 80. He has a glass eye and boundless energy. He is hard of hearing, but for him the earth sings. Peter has left behind the comforts of a life in suburban New Zealand to live and work in India. He is also quietly determined to save the world. Share and learn traditional home skills. We will start by looking at traditional recipes for food, soap, hand cream, etc. This course provides key knowledge and skills required for successful organic growing. The overall aim is to build ecosystems, promote biodiversity and increase soil and plant health, instead of relying on artificial fertilisers and poisonous sprays. Tutor: Jim O'Gorman - The Dirt Doctor.